It was just a letter. Cryptic, yes. Absurd? Absolutely. But Seattle software tycoon Micah Taylor can’t get it out of his mind — this claim that a home was built for him, by a great uncle he never knew, on the Oregon coast. In Cannon Beach. The one place he loves. The one place he never wants to see again.Micah goes to Cannon Beach intending to sell the house and keep his past buried, but the nine thousand square-foot home instantly feels like it’s part of him. Then he meets Sarah Sabin at the local ice cream shop . 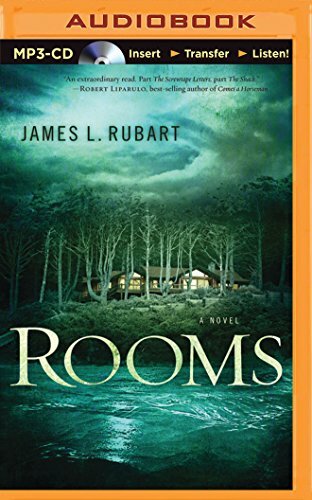 . . Maybe Cannon Beach can be a perfect weekend getaway.But strange things happen in the house. Things Micah can’t explain. Things he can barely believe. All the locals will say is that the house is “spiritual.” Unsettling, since Micah’s faith slipped away like the tide years ago. And then he discovers the shocking truth: the home isn’t just spiritual, it’s a physical manifestation. Of his soul.Will Micah run — or will he risk everything to see what waits for him deep within the house’s ROOMS? James L. Rubart is a professional marketer whose Jr2 Marketing company clientele has included ABC, AT&T/Cingular, and Clear Channel Radio. He is also a professional speaker, writes recurring columns for Christian Fiction Online Magazine and Christian Women Online, and is on the board of the Northwest Christian Writers Association. Jim and his wife and their two teenage sons live just outside Seattle, Washington.